An eminent culture-scholar Asit Mohanty had produced a well-documented thesis on how Rasagola originated in Orissa and became a distinguished dish of offering (Bhoga) in the system of Sri Jagannath. His endeavor was meant for claiming the Geographical Indication (GI) tag for this pride innovation of the people of Orissa, famous always for their matchless creativity and culinary skill. As and when a new dish of excellent taste is innovated by any Oriya, he wants to offer the same to Sri Jagannath and after detailed study of whether the dish is absolutely indigenous to Orissa, the Temple Administration / the Gajapati allows the offering, which, then becomes official dish and gets enlisted as a ‘Bhoga’. Thus a list of Chhapana Bhoga is in vogue, in the Sri Mandira system of Jagannatha, where any item, which is not indigenous to Orissa, is banned from being offered to the Lord. As for example, potato that mostly come from Bengal, being an imported vegetable called by Oriyas as ‘Bilati Alu‘ is banned from being used in Mahaprasad. This peculiar practice in Sri Mandira makes it unambiguously clear that Rasagola has its origin in Orissa; because, otherwise it would never have been used in Sri Mandira. Some of the Bengalis, who for salvation rush to Puri always, possibly acquired the technique of Rasagola preparation from Puri and started projecting the same as a Bengali innovation, exactly as they had falsely claimed Sri Jaya Dev, the author of the love songs compiled as Gita Govinda. Innumerable legends were created to show Jaya Dev as Bengali and ultimately their claim over the great love-lyricist was found to be false. They have similarly created concocted literature to show Rasagola as their own. Oriyas were usually laughing at their pretense and ignoring their claim. But when the GI phenomenon emerged, Sri Mohanty, an active sentinel of Orissan cultural uniqueness, genuinely apprehended that they may try to mislead the world on origin of Rasagola. Therefore, he urged upon the Government of Orissa with elaborate evidences in support of Rasagola’s Oriya origin, to apply for the GI Tag to this particular item of Orissa’s vast treasure of sweetmeat. 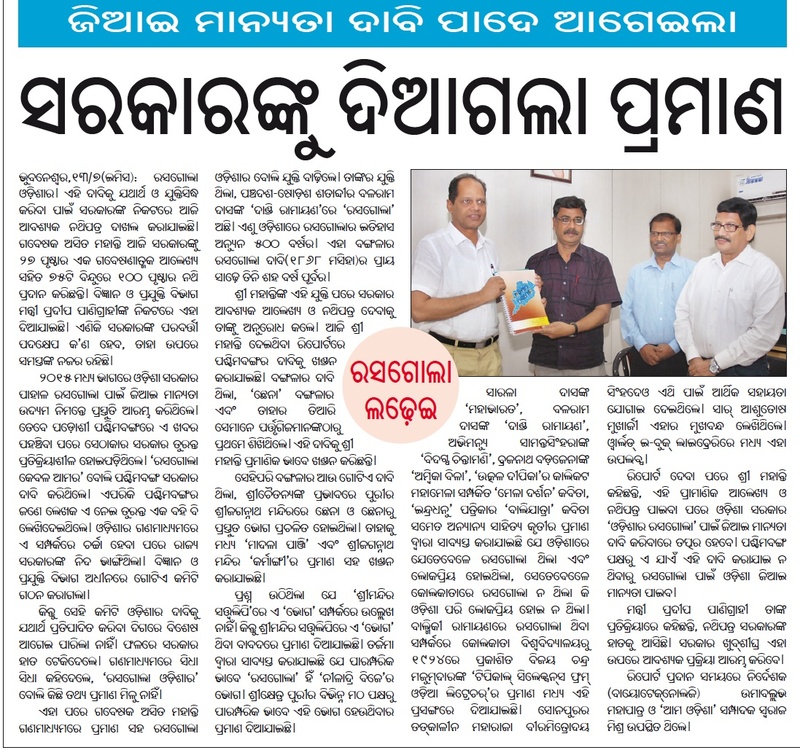 The news clip shows that he presented his well researched document to the concerned Minister Pradip Panigrahi on 14th July 2016 along with a hundred enclosures. Such incompetent is the incumbent political leadership of Orissa that the State was not allowed to claim the Tag under spurious pretenses till West Bengal obtained the tag for what she calls ‘Banglar Rasogolla’ on 14 November 2017. Whosoever slept over the document of Asit babu is certainly an agent of Bengali interest. Had that not been so, the GI Tag to ‘Banglar Rasogolla’ could not have been granted, as it kills the very purpose and the spirit of the GI concept. The GI Register has acted without application of mind in granting this Tag to Bengal. The very name – Banglar Rasogolla – is a very unambiguous confirmation of the reality, that, it is something, which is not the Rasogolla proper, but something that is created out of “Rasogolla” proper; the word “Banglar” being a qualifying prefix. Minimum commonsense could have made the GIR understand that, “Rasogolla” proper must be belonging to a geographical location which never belongs to Bengal. Hence, he should have gone for finding out the item’s real place of birth, for which the Law has also empowered him. Thus the GIR, without application of mind, has given the tag to Banglar Rasogolla, which is deceptively similar to Rasagola originally created in Orissa. The tag deserves to be recalled, nullified. When GIR order exposed that there was no application from Orissa for the Tag, caught naked, Chief Minister Naveen Patnaik wants to escape. From what Minister Prafulla Samal has said, the government is eager to file its application for the Tag. Shockingly, it not to apply for nullification, recall of the Tag given to Banglar Rasogolla. It would apply, instead, for GI Tag to Jagannath Rasagola, a nomenclature which is never in existence in Orissa. If any such application would be preferred, the State will be wronged yet again by the coterie of non-Oriyas that is controlling Orissa, taking advantage of political power concentrated in the hands of a person, who, despite being a chief minister for a fourth term, has not become an Oriya in nature and in spirit. Rasagola, which is indigenous to Orissa, will never be registered, if the application is made for the new name ‘Jagannatha Rasagola’. Somebody somewhere else may apply for GI registration of Rasagola and the same being a proper name, not qualified with any prefix, shall bag the Tag. The non-Oriya officialdom, which, by willfully ignoring the documented argument advanced by Asit Mohanty, has destroyed Orissa’s sure possibility of getting the GI Tag for Rasagola, is determined to squander away Orissa’s exchequer by appointing non-Oriya lawyers to raise the case before the GIR, as if, Orissa is barren of legal brains. The secret design may be investigated into. For our population to know how strong was the case of Orissa for GI Tag to our Rasagola, I am giving here the links to what Asit babu had helped the government with, to claim the Tag. Sadly all the endeavors of this brilliant researcher were rendered inconsequential by the Government under mysterious circumstance. It seems, in the impasse over Rasagola, as the Government is preferring a non-existent name instead of the proper name, under the de facto non-Oriya chief minister Naveen Patnaik, whose non_Oriya dominated officialdom is preferring a non-Oriya lawyer to an Oriya lawyer in the case to be raised before the GIR, Orissa is again in the trap against Orissa. looking at the current situation in context of Odisha,we can predict only one thing chaos and degradation. (i)On the issue of Mahanadi:-Central govt has done gross injustice to Odisha by refusing to set up a tribunal on Mahanadi dispute.Their point is,”Odisha could not provide sufficient evidence on the issue”.After that Odisha govt provided detail information through counter affidavit in Supreme court.Now Central govt has asked for the time till 3rd week of January,2018 to give it’s view in Supreme Court.Neither supreme court nor Govt of India have asked the Chattishgarh govt to stop all kind of construction over Mahanadi till the issue get resolved.So, due to negligence of Odisha govt(Politicians/Bureaucracy)Odisha is going to loose the control over river Mahanadi. In between this,Chattishgarh is planning to interlink river Mahanadi inside their territory. In public life this issue will neither affect Naveen Pattnaik nor bureaucrats(V.K.Pandian or anyone)of Odisha govt.The ultimate sufferers are the people of Odisha. On the contrary,Odisha govt has not taken any step to construct dams/barrages on the upper stream of Polavaram project inside Odisha. (ii)On the issue of Odia language:-Till date Odisha govt has shown little interest to make Odia compulsory in administration,judiciary and employment. Odia language also going to face the same fate as that of Mahanadi,if immediate action will not be taken. Odia language like the flow of Mahanadi is rapidly loosing it’s relevance in Odisha state.If the current situation continues Odia language will face serious consequences in coming years.Therefore,govt of Odisha should immediately open a Odia language University,Central institute of classical Odia and Odisha council of historical research without any delay.Meanwhile,Odia should be compulsory up to graduation level,Odia language should be mandatorily use in all the courts of Odisha and OPSC,OSSC,OSSSC exams should be conducted in Odia language along with English. (iii)On the issue of Rasagola:-Like Mahanadi,Polavaram,Odia language our own dish Rasagola has grabbed by West Bengal.As per the statement made by political leaders/bureaucrats of Odisha govt “they want to apply for the GI tag for Odishara Rasagola or Jagannatha Rasagola”. In Rasagola politics we have lost the battle of Rasagola due to administrative negligence or lack of will power of Odisha administration.This will affect brand & commercial utilization of Rasagola. Mahodaya,when the issue of Mahanadi,Polavaram are taking centre stage, instead of mass agitation,demonstration Odia people are busy in watching world hockey league in Kalinga stadium.That shows the sensitivity,resolve,,character of Odia people towards the above issues.Leaders & bureaucrats who are the real culprits are trying to divert the attention of Odia mass from real issues to non-issues. It reminds us an incident in the life of Utkal Gourab Madhusudan Das. On the contrary when Kaveri tribunal asked the Karnataka govt to release certain amount of water to Tamil nadu mass agitations/demonstrations had taken place in many parts of Karnataka.Even the issue could not resolved by Supreme court or Central govt.The whole Karnataka,it’s political parties got united on this issue. This is the resolve,character of Kannada people and their political parties. PM Modi who is an expert politician, have in depth knowledge about the functioning of Odisha political class & bureaucratic set up.He also knows the character of Odia people.Therefore,favoring Chattishgarh,Andhra on Mahanadi & Polavaram is not a surprise move on behalf of central govt. Finally,we Odias can fight over every small issue which bears no relevance in our public life,but while fighting for the interest of Odisha we become dumb & fragmented.